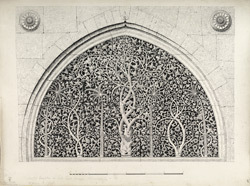 Illustration of a window from Sidi Sayyid's mosque at Ahmadabad in Gujarat from James Burgess' 'Original Drawings [of] Muhammadan Architecture of Ahmadabad. 'The Sidi Sayyid mosque, built between 1572-73, was constructed by a nobleman at the court of Sultan Muzaffar III (r.1561-72) along the citadel's walls. The mosque is known for the tracery designs in its ten semicircular shaped windows.